Just Reserved 1 for my kids to pick up tommoro, thought I'll share the deal with you, Great to have fun with your kids this Xmas. Now you can play the award-winning hit TV game show at home. The dilemma is now yours; will you say Deal or No Deal? Play against friends or family or pit your wits against the banker. •Play the award-winning hit TV game show at home. •With 22 red boxes, an electronic banker it's all here. •Play against friends or family or pit your wits against the banker. 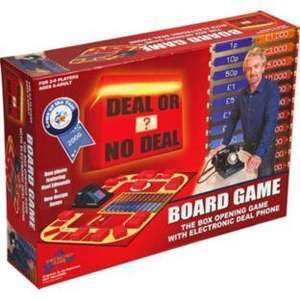 •Contents: 1 x playing board, 22 x boxes, 22 x amount cards, Deal or No Deal Cards, 1x electronic phone, 1 x score pad, 22 x blanking cards and 1 x instructions. •Batteries required: 3 x AA (not included). •For ages 8 years and over. •Not suitable for children under 3 years old. I can't see the point of this game? There are 22 sealed boxes, but only one question: deal - or no deal?